Go to Boston. In the Beacon Hill neighborhood, you will find the Paramount Restaurant. 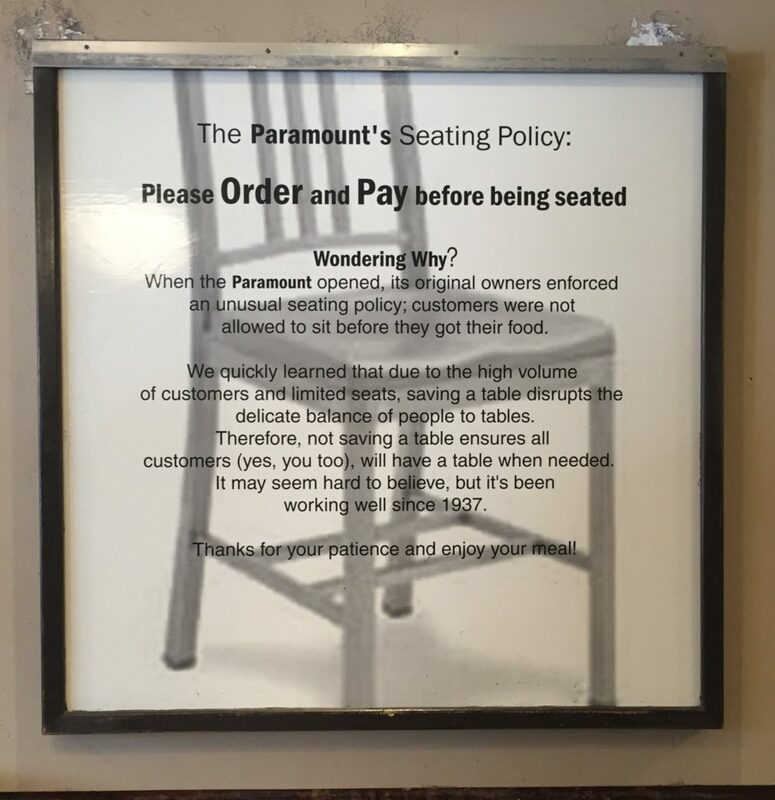 The Paramount is both a great eating experience and a fine example of Lean production. The restaurant was opened in 1937. Its unusual service policy that is prominently posted on the wall and states, “Please ORDER and PAY before being seated.” Through this policy, the restaurant balances its limited seating capacity with its large number of patrons. Most restaurants follow traditional production models. Waits are expected. There are multiple hand-offs and delivery bottlenecks. Consider you are going to a traditional restaurant for Sunday brunch. You arrive and there is a line. The host maintains a list, but you don’t know your standing. You wait. Finally, a table is available. The host seats you and gives you the menu. You wait. The server arrives to take your drink order. After several minutes he returns with your beverages and takes your meal order. You wait. Your meal arrives. You eat. You wait. The server returns and asks if you would like anything else. You say, “No. Just the check, please.” You wait. The server returns with the check. You review the bill and put your credit card down. You wait. The server returns, runs your card, and then comes back with your card and receipt. Work is pushed through the system causing bottlenecks in the process. The flow of work is based on the customer, not the restaurant’s ability or capacity to serve the patrons. Customers are seated based on the availability of open tables. Orders are sent to the kitchen regardless of the kitchen’s current capacity. Typically, orders back-up at the stations with limited staff or physical resource (e.g., grill size, or number or cooks working that station). There are multiple waiting steps. At most sit-down restaurants, the waiting time may equal or exceed the amount of time spent eating. There may be a dozen unique waiting states in the process that can last several minutes or more. These waits represent waste. Work is not visible. There are two important processes where status of our dining experience is not transparent or visible. As patrons, we don’t know our place in the reservation queue or where our orders stand with the kitchen. There is a lot of motion and handoffs. The servers, busboys, food runners are in constant motion. The average waiter takes about 23,000 steps (4 miles) on an average shift. They are transporting orders, food, dirty dishes, refills, etc. Consider the number of discrete steps between the time the order is placed, and the food is delivered to the table. The payment process alone may have a half-dozen steps that requires the server make at least three trips to the table. Deciding early in the process. We don’t usually consider this, but we make our eating decisions early in the dining process. We place our order and don’t have many opportunities to change our mind if we see something that looks more interesting. The Paramount has a unique operational model. When you enter the restaurant, there is a large sign on the wall telling patrons that they cannot take a seat until they have placed their order and paid. On a busy Sunday morning, the line that starts outside the front door and extends all the way to the back of the restaurant where the cooking line is located. When you reach the back of the restaurant, the menu in on a sign above the grill. You place your order and the line cooks immediately begin working on your meal. You take a few steps and pay for your meal. As you pay, your food comes off the line and a food runner takes your plates to an open table. Meals are delivered as fast as possible. The restaurant is organized to optimize the ability of the kitchen to deliver. Meals are cooked as quickly as possible and delivered to the customers quickly. Customers are pulled through the process. The customers and their food orders are pulled through the process one-by-one. The staff can regulate the flow of customers and work by accepting the next order. If all of the seats are taken or the cooks are working on too many orders, it is easy to delay the next order to manage the flow of work. There is transparency into the process and visibility into the work. The line and waiting queue are apparent the second you enter the door. As the customer, you can see how many people are ahead of you in line. Similarly, the lead cook, who manages the flow of orders, has immediate access to key performance information. She can easily see the how many are tables available and if the cooks have capacity. Throughput and cycle time can be calculated. Based on the flow patrons through the process, it would be fairly easy to estimate cycle (wait) times. Based on a short survey of the number of patrons paying for their orders and departing for their seats you can tell how quickly it takes for each order to be processed. Deciding as late as possible. As patrons walk through the restaurant, they have the opportunity to inspect (but not too closely) other peoples’ meals. You can also to talk to other customers in the line to learn about their favorite items. Since you don’t commit to an order until just before it is prepared, you can change your mind based on the information received during the wait. My wife and I changed our mind several times and ordered a third dish to share just because it looked so good. Unnecessary motions and handoffs are limited. The Paramount has minimized number of steps, motion, and transportation by its staff. There are no elaborate systems to capture and track the orders; the lead cook takes your order and immediately communicates it to the line. There are only two people working on the floor and they generally only visit the table to deliver your food and clear dishes. The payment process is handled as a single transaction; there is no back and forth to the table. The Paramount is a wonderful and very popular restaurant. The food is very good and is delivered fresh from the kitchen. If you are in Boston, visit the Paramount. Enjoy a good meal and marvel at the process.